Jasmine Dotiwala. | Jasmine's Juice. The news, views and fabulosity from the UK's most connected fly girl. Mover, Shaker, Connector. Thursday 26th March saw The Scene introduce professional gong bather and wellness expert Nicole Harvey, fierce and fiery body positive supermodel Charli Howard, trailblazing songwriter Jin Jin and the no-nonsense women from Club Frsherz fighting for equality in music. JASMINE WITH WELLNESS EXPERT AND GONG BATH SPECIALIST NICOLE HARVEY. First to speak with Jasmine Dotiwala on how she is impacting the world through sound was guru Nicole Harvey who describes herself as someone who walks the walk, talks the talk, and believes strongly in creating change through art and healing. Along with Nicole was a 32 inch gong that she brought with her to the BBC Radio studio. She refers to her gong as ‘he’, saying the gong has been attuned to Saturn which gives it a masculine energy that she challenges Jasmine to get near and feel. She says it doesn’t matter if you’re a cynic, the science backs up that gong baths are brilliant for stress relieving and opening blood cells up. Live on Jasmine Dotiwala’s show, as she would in her classes, Nicole takes her gong mallet, lightly thuds her gong, and leads London into a highly and shockingly relaxing gong bath – at no extra cost! She says in classes, trap nerves have been released, kidney stones have been shifted, insomniac sleep and anxiety sufferers healed and much more. Nicole begins to then teach that not only are gong baths helpful, but we can also stimulate the mind by incorporating ‘mantras’ – she leads us to put our hands on our hearts, breathe in, and make a long ‘aah’ sound, a sound she says generates compassion. It’s safe to say that Nicole left the London listeners spiritually enlightened. For more relaxation, you can find her at www.haveyourmagic.com and @Haveyourmagic on Twitter. Next up is 27-year-old Charli Howard, a model and body image activist who once wrote a blog post that went viral when she was fired by her modelling agency for being ‘too big’. 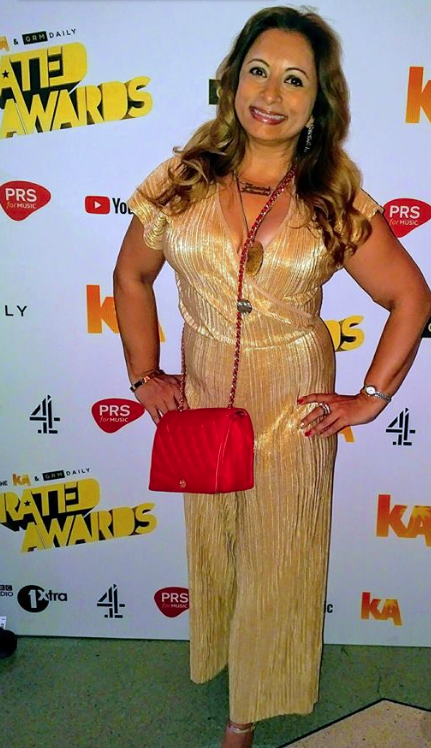 She has created The All Women project which goes into schools to teach body positivity, written a book and has been featured in magazines from London to L.A including British Vogue. She is now also a body positive columnist at Glamour UK as well as the new campaign girl for underwear brand Agent Provocateur. Charli, who was always steered away from journalism by her family, decided to embark on a course called CREATIVITY WORKS with Media Trust that would introduce her to new journalistic skills. But when she was dropped by her modelling agency midway through her course, it was then that she would then use those skills to write a fiery blog post. The post reads: ‘Here’s a big F you to my now ex-modelling agency for saying that at 5ft 6 inches tall and a UK size 6-8 I’m too big and out of shape to work in the fashion industry. I refuse to feel ashamed and upset on a daily basis for not meeting your ridiculous unattainable beauty standards and the more you force us to lose weight and be small, the more designers have to make clothes to fit our sizes and the more young girls are being made ill. It’s no longer an image that I wish to represent. If an agency what to represent me for the woman I am, I’m more than happy to take your calls, but until then I’m off to Nandos’. 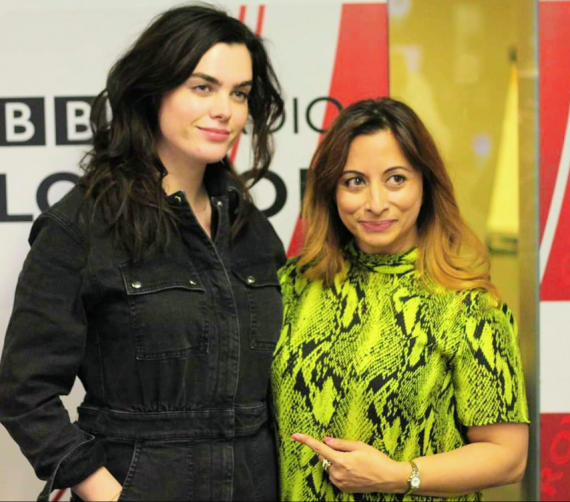 After this blew up, a very shaky Charli was approached by some of the biggest broadcast companies, and with the help of Jasmine Dotiwala (her then tutor) on the Media Trust course, she was able to represent herself and speak further on her story to companies like the BBC. Charli says that despite being a size 6 at the time and suffering with an eating disorder, she gained weight and was approached by an agency to work in New York doing plus sized modelling. She says that on entrance to the agency were two walls, one showing catwalk models who looked very moody, and on the other side where there were only about twelve cards were women radiating with smiles. Charli says she was surprised that the plus models were the ones who were actually happy and enjoying themselves. Charli admits that calling a size 10-12 model ‘plus sized’ is controversial, but that in her being one, she is representing women like herself who still find it gravely difficult to get by in the fashion industry. Charli says if she could speak to her 15-year-old self, she would tell her to surround herself with good people and unfollow accounts that make her feel bad or insecure about herself. She also says you absolutely do not need professional photos to get into modelling – an aspiring model can take a quick photo of themselves with no makeup on or simply walk into an agency! Charli speaks on her All Woman project, in which she got together both slimmer and plus sized models to create unity between all. She says she was then approached by big companies to then help strategise to make body positivity a main component of their brands. Charli continues to rock the industry, you can see what she is getting up to on Instagram @CharliHoward. The 3rd guest in the studio to speak on song-writing and music production is song writer to the stars Jin Jin. Mancunian girl Jin Jin has co-written dozens of chart topping songs including ‘Hold My Hand’ by Jess Glynne and ‘Alien’ by Jonas Blue and Sabrina Carpenter. She has worked with people of the likes of Fraser T Smith, Dave, Ms Banks, Raye, David Guetta, Sigala, Rita Ora, Paloma Faith, Madison Beer and many more, and has received accolades at platforms such as Women in Music Awards. Jin Jin says she has been writing songs for five years and started in her grandfather’s reggae record shop. She soon progressed into the music scene at university where her friend introduced her to artist Target. Jin Jin who was already known for working with grime groups such as Roll Deep, says she started to be noticed through collaborations with any one she was interested in. She says it doesn’t matter whether or not someone has accolades in song writing and advises people to work with anyone who is talented. Jin Jin says she met Jess Glynne 5 years ago and would create songs with her in local pubs. She says she enjoys meeting up with artists to connect with them and understand their stories before making songs – almost like a councillor! When it comes to creating the actual songs in studios, Jin Jin admits that she and even the artists she works with don’t usually have many diva demands. She says that studio time is typically a moment for top artist to be themselves, let their guards down, remove egos and be comfortable in a relaxed, closed and safe environment. Many of us wonder why songwriters desire to be behind the scenes rather than taking the front line fame in projects created by themselves. Jin Jin tells Jasmine that she would never move into singing on stage, rather she feels satisfied with simply bringing ideas to the table and letting the artist bring it to life. She also say that her Mancunian accent makes things sound a little funny, she’d rather not embarrass herself! JASMINE WITH THE CLUB FRSHZ CREW. Last but certainly not least on The Scene are revolutionary music group Club Frsherz whose compilation of new songs seeks to empower and support all black people through positive and personable affirmations. To speak on their ‘Black playlist’ are three of six members of Club Frsherz. Founder of the group Skandouz says his inspiration to get the group together was a dear friend dying of sickle cell anaemia, he says there are not many positive representations of black people. He wanted to tell their stories and decided if nobody else would do it, he would. Coco 7, a female musician says she was excited to collaborate with Skandouz on the project to promote an ethical message about black people. Miss Ranger, a pianist says she enjoyed music from a young age but fast realised she could not sing. It was here that she discovered NWA – her view on music would change forever. And Zara Sykes who has also been rapping from the age of 9 decided she would jump on the project to represent Birmingham. Creating a combo of ten separate songs all made by women including ‘Buy Black’, ‘Black Friday’ and ‘Young Gifted and Black’, the album boldly and fearlessly promotes black intelligence, empowerment and uplifting of a race usually outcast and seen negatively. Skandouz says his team are wordsmiths who challenge themselves to think outside the realm of popular profane language within their songs. They say they do not condone the ‘N’ word or any type of profanity in their music, adding that you can be edgy whilst still being respectful within your speech. Club Frsherz says children should be open to a wide world of vocabulary. They seek to build a legacy rather than create quick, throwaway music that so many people are currently creating. Coco 7 says she celebrates black women as there is not enough range in the industry. 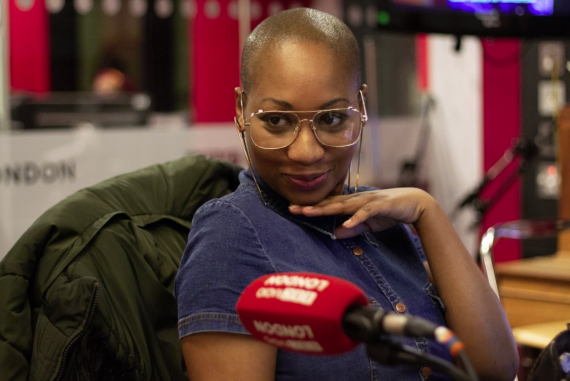 She says she blames the industry and the cogs behind the machine that doesn’t allow a wide range black women to make versatile music – female MCs are lead into the industry one at a time. Whilst many would say that the music she makes excludes people of other races, Coco 7 says that in fact the movement is inclusive, allowing women who have been ostracised to be a part of doing something great that they otherwise would not have the opportunity to be part of. Full information on all members off Club Frsherz and their impactful movement on Twitter @ClubFRSHERZ! 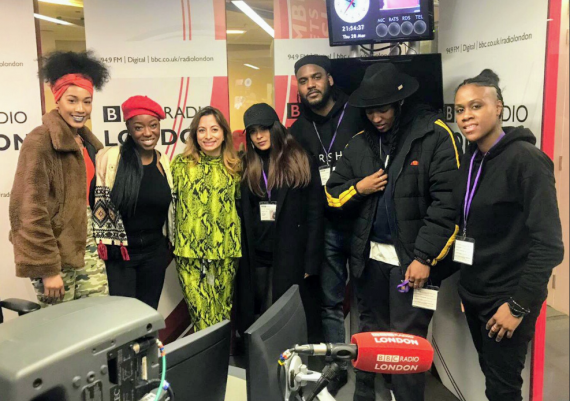 JASMINE’S JUICE – Breaking Ceilings……The Scene – BBC Radio London -21/03/19, by Lucrece Grehoua. 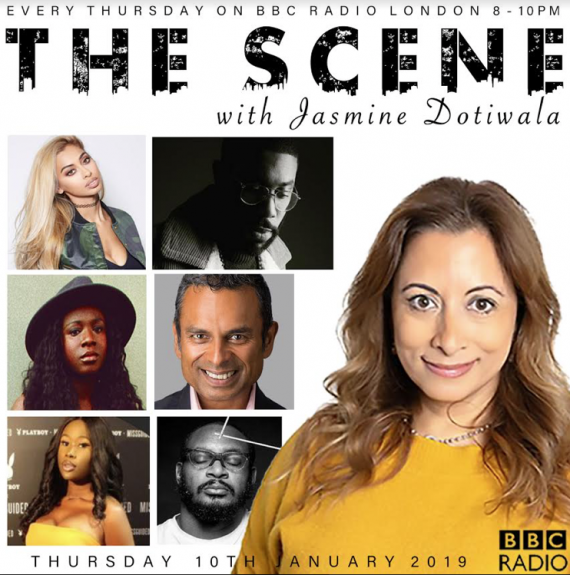 Today on The Scene, Jasmine Dotiwala talks apprenticeships, breaking into media and the Afrobeats movement in the music industry. First up are Gennaro Costaldo and Ramon Lewis of the Brits Apprenticeship scheme that gives 10 people of all backgrounds the opportunity to develop a career in music with training and mentoring. JASMINE WITH GEANNARO CASALDO FROM THE BPI AND RAMON LEWIS-AN APPRENTICE ON THE BRITS APPRENTICESHIP SCHEME. Apprentice Ramon Lewis explains how he became an apprentice at Key Production, and how he went from working in office support to being a core part of the BRITS, being invited to flashy events and rubbing shoulders with important people in the industry. He now manages the company’s social media network, helping to represent the face of the business. He explains his roles in exercising due diligence and how he has grown in maturity and professionalism because of the scheme. Gennaro Costaldo, communications manager at the Brits explains how £21million is raised by one BRIT Awards show alone, which then allows for the existence of BRIT school, the famous school for people trying to break into the entertainment industry. It also funds musical charities such as ‘Music Support’, an incentive that deals with mental wellbeing, addictive behaviours and the pressures that come with working in the industry. He describes how proud he is to be able to extend the money to fund young people like Ramon, who have no experience in the field. With less than a month left of Ramon’s apprenticeship, Gennaro explains that to get a job in the music industry you must be passionate with a real desire to get on, never take no for an answer and be ready to delve into the many facets of the industry. He says there is a role for everyone! To keep up with the adventures of the current Brit apprentices, head to the Brit Trust website where monthly blogs are written about their journeys. JASMINE WITH MONIKA, HADEEL AND TOBI- TALKING ABOUT THE MEDIA TRUST / ITV NEWS PROGRAMME BREAKING INTO NEWS. 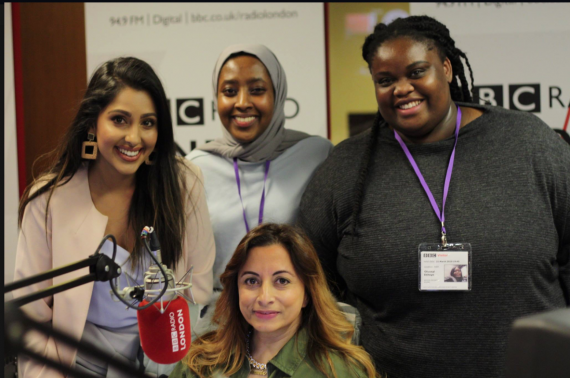 Next to feature on the show speaking on Breaking into News media and journalism are Monika Plaha, Hadeel Elshak and Tobi Iji. 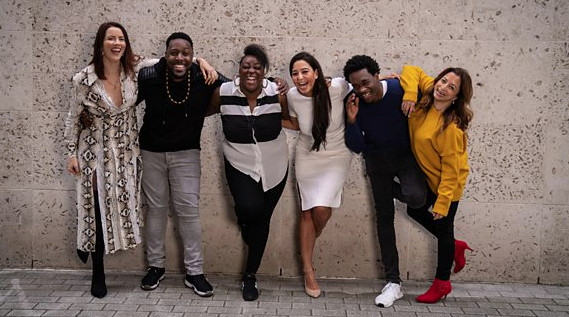 Tobi – Project Coordinator at Media Trust -who champions diversity- describes Breaking Into News as an 8-year running programme aimed at anyone who has a local story to tell. She mentions amazing stories previously made by finalists such as one in Wales about people who only speak the local language, another about how Brexit would affect the Polish community, and even one about the rise of eco-burials. Monika says she entered whilst in her second year of university, explaining how she had applied for hundreds of internships and got rejected from each one. She managed to get an internship as a crime journalist in Malaysia, however what happened when she was there would be the basis of her application. She explains how walking around shopping centres in Malaysia she would be approached by vendors asking if she wanted to lighten her skin. Scrolling through social media to see how she could get her story out was when she came across the Breaking Into News ad. Monika who is now a journalist for BBC Breakfast describes how great of an experience being accepted was. She says even 7 years later, it was the biggest breakthrough of her career. 20-year-old university student Hadeel was also accepted onto the scheme managed to work with ITV News to tell a story that has impacted her greatly; Grenfell. Her story focused on the politicisation of the tragedy and the distrust of the system that many of its victims felt. 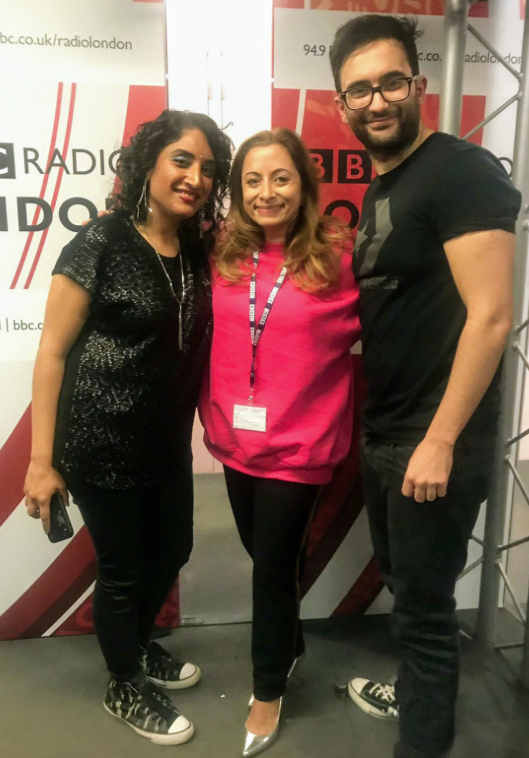 Hadeel says her story on Grenfell was not about her but rather it was an opportunity to narrate stories of others as well as show local venues in Harrow that she felt needed to be on TV. Breaking Into News allows for those who have had no experience in the media to research and cover a unique passion point, be mentored through the process all whilst being taught the fundamentals of newsrooms and TV journalism. Apply for Breaking Into News by going to the website and submitting a short written or video application of an interesting story that packs a punch and hasn’t ever been told before! 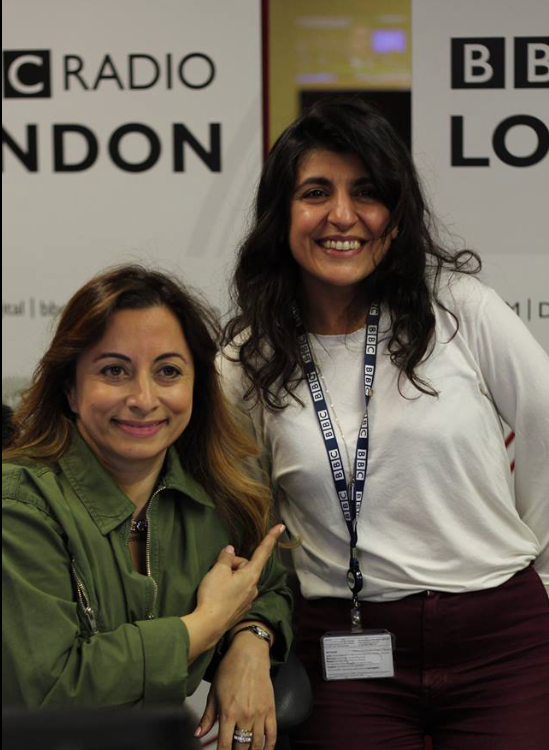 JASMINE WITH SHEYMA BUALI- DIRECTOR OF THE BBC ARABIC FESTIVAL. Next on the show is Sheyma Bulai, London-based writer specialising in cinema, visual and urban cultures from the Middle East. Bulai is also the director of BBC Arabic festival. The Arabic Festival Bulai explains, is one that documents films by international directors about current situations in the Arab world reflecting social and political issues. She goes on to talk about of the wave that is showing more and more Arabic people speaking on adverse issues such as sexism but recognises the broadcast rules that bypass the local rules of Arabic countries; places where many have a fear of the camera. The BBC Arabic Festival shows a rise of stories where females are the protagonists, and Bulai explains that many are actually written by men themselves, such as ‘Sabeya’, a fictional story reflecting an elderly women trying to ensure her granddaughter does not get abducted by Yazidi ISIS members. The range of stories however Bulai says is very wide. The film festival is the only one that takes place at the BBC Broadcasting House and open to all types of people! Get your tickets here: http://www.brittrust.co.uk/apprenticeships/. 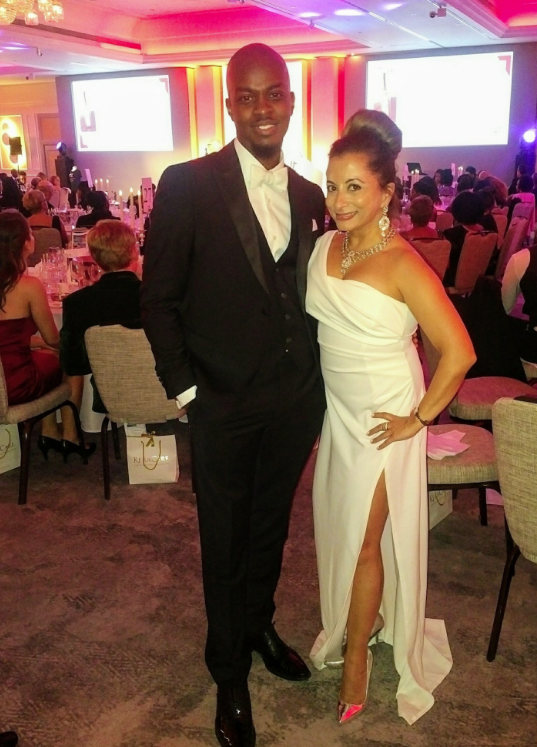 JASMINE WITH GLOBAL AFROBEATS MUSIC STAR FUSE ODG. Lastly on the show is Nana Richard Abiona also known as Fuse ODG, internationally-renowned recording artist, Afrobeats musician and pop-culture infulencer. Fuse, who grew up between Ghana and London and who rose to fame with smash hit song ‘Azonto’ in 2003 begins by detailing the disparities between the places he grew up which would be the motivation of his career. He explains that unlike Ghana, in the U.K. he would be seen as the Black, African boy whose representation in the country was not always the best. He overcame bullying in school by standing up for himself when picked on for his accent and the perception of him as an African that many had through the media (namely, African children in adverts with flies hovering around mouths). He says he could understand why people treated him the way that they did, but also how through his musical representation he was able to take a stand for the ‘African kid’ in him. His first inspiration to make music was his desire to go back to Ghana to be at one with the music, food and culture. Once he finally went he says he was astounded by the ‘world-class’ talent and knew he had to do something to shift the perception of Londoners who knew only about giving money to charities for ‘poor’ African children. 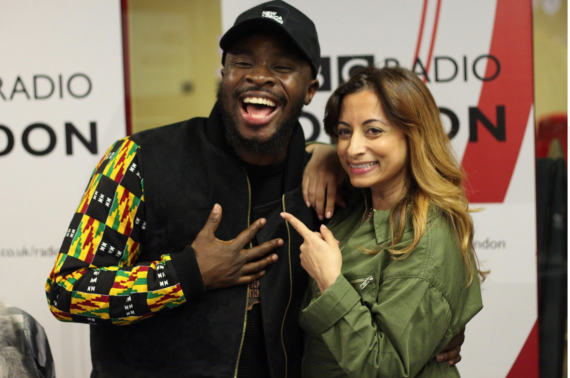 Fuse ODG says he wanted to create music that would move and capture people the way he was by those in Ghana. He decided to take a popular dance in the country and made a song that he would release in London. Dance number ‘Azonto’ influenced people around the world including Beyonce, Kanye West and former Prime Minister David Cameron. Going on to produce more hit singles, Fuse ODG says the secret to his musical success is simply ‘good vibes’. He believes his purpose is higher than just music and explains that he and team have a spiritually led goal to bring awareness of Africa and the goodness it has to display to the wider world. He says Africa is not a poverty stricken place, but rather one that you can go on holiday to, have fun and conduct business in. He has managed to create ‘proud Africans’ of his musical movement both in the Western world and what he now refers to as the ‘new’ Africa. Explaining why he turned down a proposition by Sir Bob Geldof to make a big appearance on Band Aid 30, he says that despite how amazing the opportunity would be to be on the same bill as artists such a Ed Sheeran and One Direction, his purpose was to steer away from the very media outlets who portrayed people like him in a stereo-typical light. His first priority he explains, was not to encourage people to give £2 a month and move on with their lives but to encourage them to see the value in spending holidays in Africa as they would in places like Vegas, and giving their money in more meaningful and fun ways. He describes the ‘crippling’ effect of movements like Band-Aid that use lyrics such as ‘bring peace and joy to West Africa’ – as if there is none. He went on to challenge Sir Bob Geldof’s lyric, asking if it would be possible to change the lyrics and visual representation. Once Geldof refused, Fuse declined the offer, saying he could not believe what he had just done, but was proud that he stood for Ghana and has in the long run been a part of a group of leaders that have managed to change the perception of Africa in other ways. Fuse ODG who has been building schools in Ghana since 2007 amongst other incentives, says he wants to build a new love for Africa that will allow the continent to make headlines the way European countries do when disasters strike. He has received immense support for his charities including from Ed Sheeran who gave back to by buying a bus and even helping to build a bridge. However, Fuse said he wanted to have a word with his pal Ed as he had made yet another Comic Relief story this year which Fuse didn’t approve of. Fuse ODG is busy with many projects that include as his clothing brand, ‘New Africa Nation’, manufacturing Black Barbie-type dolls depicting historical black figures, and his ‘T.I.N.A’ festival based in Africa with past performances from the likes of Lethal Bizzle and Joey B. Listen to Fuse ODG’s new album ‘New Africa Nation’ with features from Damian Marley and Stefflon Don. 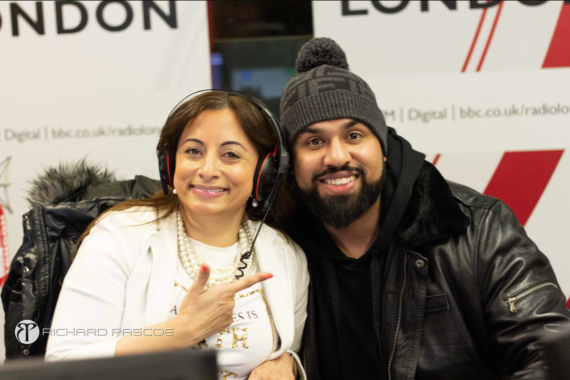 JASMINE WITH COMEDIAN, ACTIVIST AND AUTHOR HUMZA ARSHAD AT BBC RADIO LONDON. PIC CREDIT – RICHARD PASCOE. The Scene presents four different inner city London men who as individuals found their way from struggle to strength. Speaking to Jasmine Dotiwala, they represent ways in which they were able to transform their narratives into literature and entertainment as a means of telling their stories. First, one of the U.K.’s most popular Asian comedians and creator and star of hit YouTube show ‘Diary Of a Badman’, Humza Arshad. Humza who grew up in Streatham and has generated 96million views on YouTube says growing up he was only remotely good at making a fool out of himself. It was then he realised that he could use his curious talent to make others laugh. Diary Of A Badman which has now almost become a household name and the cause of heavy, rumbling laughs across the U.K. was born out of frustration when Arshad realised that he would be subject to prejudice in the entertainment industry for being a Muslim man. 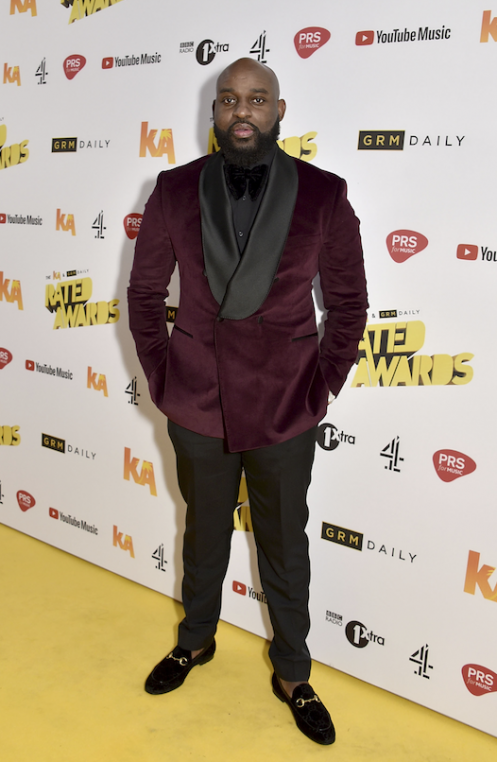 Like many other rising social media stars, rather than ‘wait for the phone to ring’, he decided to set up shop creating short online skits in 2011 which would soon garner the attention of the BBC and other production houses. In his most recent project, a children’s book that has gained astounding traction, he recalls being approached by Penguin speaks on whether or not he believes the new-fangled diversity movement in publishing is genuine. Irrespective of it, he says that representation is extremely important and is therefore content in the fact that publishers are finally seeing the need to influence young children of BAME backgrounds as well as white. In June and July 2011 jointly with the Met Police, Arshad visited schools to give presentations to students. Discussing topics and issues encountered by teenagers living in London, he says he found that it wasn’t only Asian boys connecting with his work. Arshad says he has inspired hundreds of the children to read – including his younger cousin who once was unable to get away from his PS4! However he declares that he will never be content until he reaches new heights in TV, film, publishing and other forms of entertainment. JASMINE WITH ”SAFE” AUTHORS’S SYMEON BROWN, NELSON ABBEY AND DEREK OWOSU. PIC CREDIT – RICHARD PASCOE. Second to feature on the show were three Black male authors who recently wrote the newly published book ‘SAFE’. Derek Owusu who is the host of hit podcast ‘Mostly Lit’ – and who also edited the new book ‘SAFE’, Symeon Brown who is a reporter for Channel 4 News, and Nelson Abbey, a media executive whose book ‘Think Like a White Man’ also comes soon to Canongate publishing firm. Written by and for 20 British black males occupying a range of different work industries and professions, ‘SAFE’ describes the experiences of black men in all facets of life from mental health to colourism, and violence to homophobia. The trio begin by sharing some funny yet pretty alarming experiences they have been through as black men in the workplace and in wider society, such as having to look over their shoulders if huddled as a group in order not to alarm their white colleagues – something many black people can relate to! Derek Owusu speaks on how the idea of the book came about explaining that there was a dire lack of Black authors; in 2016 there was only one Black British debut fiction author published in the U.K. It was here that he decided to round up 20 Black men for the ultimate writers’ link up. Nelson Abbey and Symeon Brown both go on to explain how keen they were to join as authors for the book, and both speak on their vastly diverse chapters. 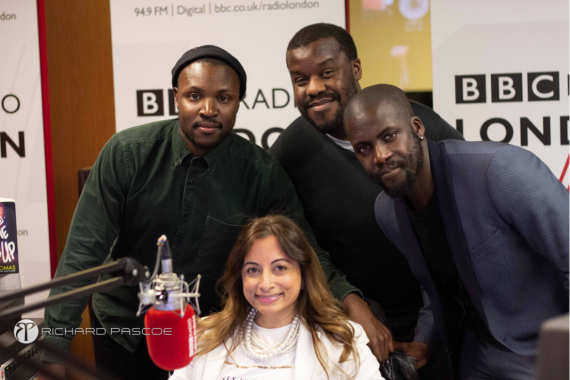 Channel 4’s Symeon Brown begins by delving into the problems surrounding the availability – or lack thereof- of social and dance spaces for black men in London. Speaking on Hackney’s now closed down club, ‘Vision’, he says, “Where you go to dance as a Black man is hard”, adding, “a part of the dilemma and question that I was posing in my piece (was) where do black men go to dance spontaneously”. He explains the difficulty of finding spaces in London’s increasingly pricey clubs and speaks on the hierarchy of network that Black men must be acquire if wanting to infiltrate West End clubs without being turned away at the door. He goes on to speaks about places in Shoreditch which he says are supposed to be more ‘open minded’ slowly becoming harder to turn up at for an impulsive night of fun. Nelson Abbey on the other hand speaks about the portrayal of ‘the Black male image’, and who in the media controls it. In his chapter he touches on four themes in the entertainment industry which he believes black men fall into; ‘comical, childish, cringe worthy and criminalised’. 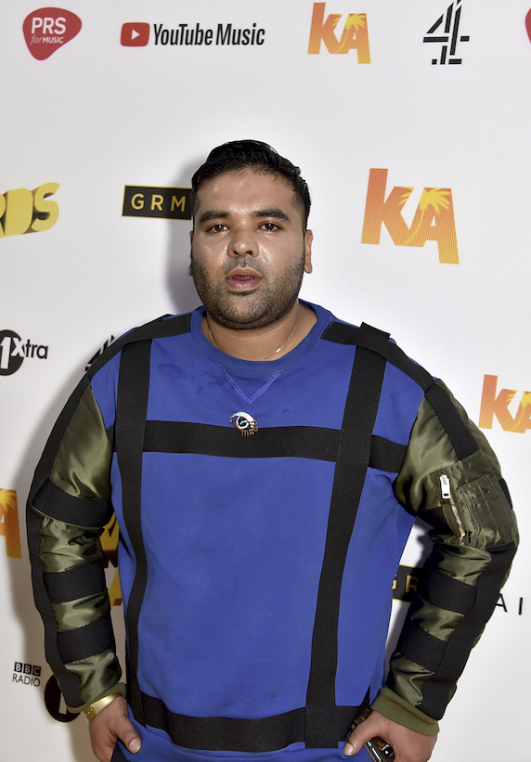 He uses Big Narstie as a prime example, a former rapper and comedian who blew up after videos of his rollicking laughter and rumbustious jokes started to go viral over social media. Subsequently Big Narstie was given a TV show with Channel 4 called ‘The Big Narstie Show’. Abi describes him as ‘infectious’ and ‘charming’, but also says that through no fault of his own, Big Nasrtie, ‘a brother trying to make an honest living’, has been defaulted into the Minstrel; the sparsely articulate, physically over-expressive bafoon playing up to preconceived wild black stereotypes largely for the consumption, comfort and confirmation of white audiences. Despite his disappointment in the default dumbing down of the Black man, Nelson goes on to speak on mortifying experiences he has had being told that he is not black enough due to being too ‘intelligent, middle-classed and successful’. He expresses times having to challenge former bosses but also how he balances his ability to codeswitch in certain situations. Derek Owusu says SAFE was written to outline the vast difference in racial experiences between the U.S. and U.K. are hopes to one day get SAFE on the educational curriculum When asked whether or not the new movement in BAME writers was simply a box ticking exercise by publishers, Nelson Abbey admits that books are getting signed but people are not getting the promotional push and follow through, he hopes however that as more people from BAME backgrounds get published, that they find the ways to push through by their own means. You can find more about SAFE by checking the hashtag #SAFE or #UsManAreSafe on Twitter. 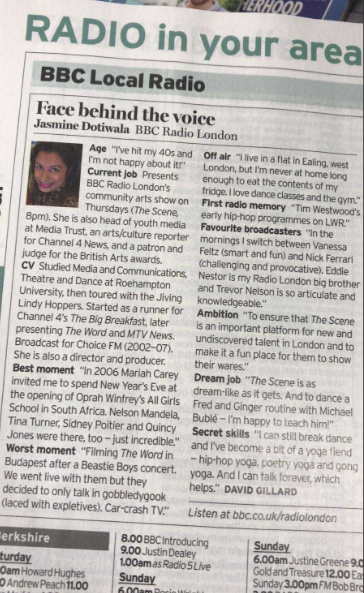 Jasmine’s Juice – Look mum!….I’m in the Radio Times! Jasmine’s Juice – Davido conquers in the latest afrobeats takeover at the O2 Arena. 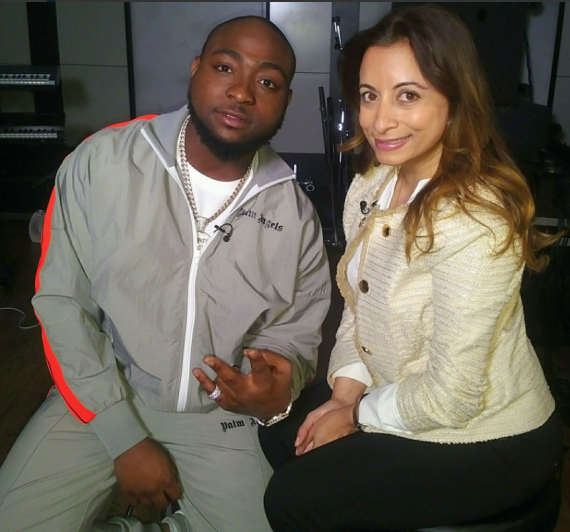 Nigerian musical super hero Davido came, saw and conquered at his o2 show. He had confessed he was nervous 4 days earlier when I sat down with him for a TV interview, but on the Sunday evening he gave the fans what they came for. 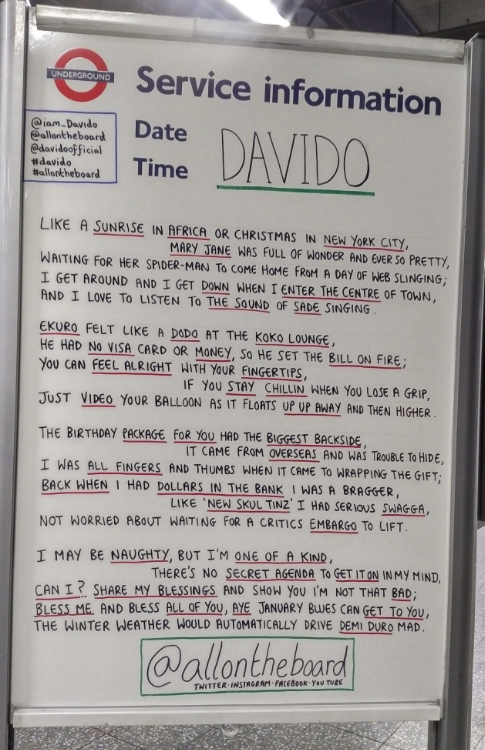 The o2 was a buzz from the tube station all through the dome as fans packed in to see one of the- if not THE – biggest afrobeats stars on the planet. Actor Idris Elba whipped the crowd into the opening frenzy as he introduced Davido. And from that moment the arena was wildin out! A high energy show full of thoughtful, regular stage excitement with full band (the composers), dancers all dressed in lime batty riders and crop tops, backing vocalists in white robes, a flying space ship saucer to make his entrance, fire balls, smoke shooting into the air, ribbons streamers and more. Walking out onto a spotlit catwalk satellite stage so his adoring fans could get even closer to him, the stalls area which is usually seated had no chairs so it could fit in even more standing jumping fans. It was like carnival. The crowd were dressed in mega swag. From Dior to gucci to Moncler and more the fashion was ON and lit. You’d never know it was winter in London. The ladies were mini skirted, shorts, high heeled and in their best “look at me” garms. Crisp white sneakers and finery were the order of the night. Music act Russ Millions popped by to give Davido a quick breather performing his hit Gun Lean. No scrimping was done in production, this show had it all. I did wonder what Davido would make of the British audiences lack of mega hype energy that we always see in audiences abroad. We can be a little stush in our energy and screaming us Brits right? The whole gig felt like a great moment reminiscent of the early days when names like Jay Z, Eminem, Nas and more were known only by the real music fans, before the commercial brands and TV folks tried to hunt them down. Much was made of whether Davido had actually sold out the venue, which was a minor sticking point in the major picture. There were a set of seats at the very back of the arena that were empty. However when you consider that the stalls floor seating had been removed and that floor area of the arena as packed solid as were all the balconies in circumference, trust me, this was a sell out. I’ve seen huge American proclaim to have sold out this space with much less seats sold. A slew of celebrity names were in the house too. West Africa’s prodigal son did good. Extremely good! 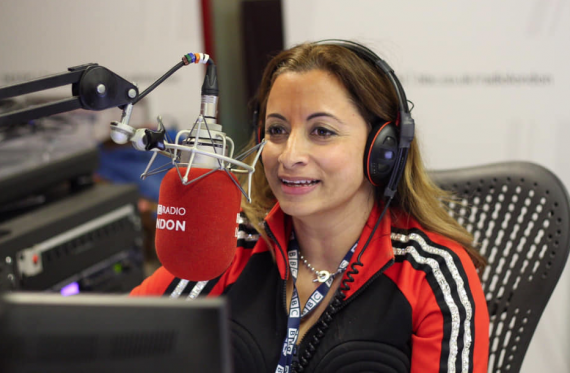 Jasmine’s Juice- Hear me hosting The Scene – Every Thursday 8-10pm, on BBC Radio London! How was your Christmas holiday season! Can you believe that the BBC have trusted me with my own BBC Radio show on BBC RADIO LONDON? I’m one of 6 new weekly presenters who hosts a slot called THE SCENE every night from 8-10pm. I present every Thursday nights show! The Scene is all about giving a voice to London’s unchampioned ARTS & CULTURE talent and celebrated London talent thats rarely given a mainstream platform. 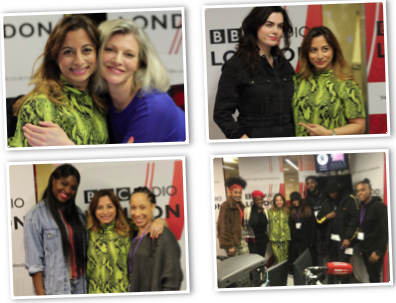 6 NEW PRESENTERS ON BBC RADIO LONDON- THE SCENE! This weeks show will be just as fun! Join us! 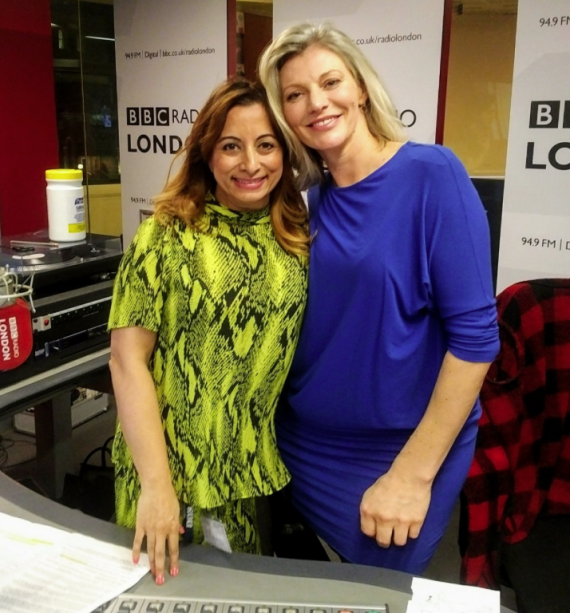 This Thursday Jan 10 2019, on #TheScene @BBCRadioLondon I will be joined by London’s finest talent! 5. So Solid Crew legend- @Harveyofficial ! 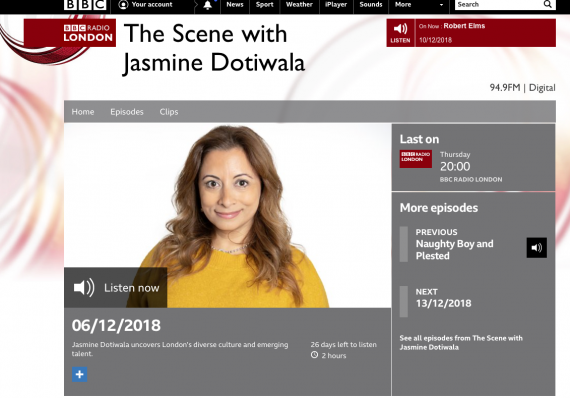 Jasmine’s Juice – The Scene on BBC Radio London! 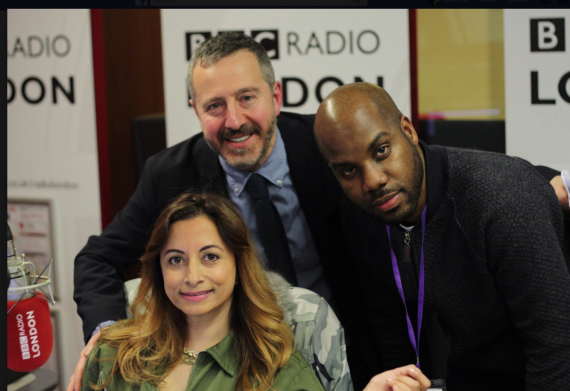 So all those people who used to listen to me on ChoiceFM with George Kay a decade ago can rejoice again- my dulcet tones are back on the radio and this time, its the BBC who have trusted me and 5 other presenters to host a new evening show titled The Scene, on BBC Radio London. The Scene is from 8-10pm each night and its a platform for London’s hidden, new and undiscovered Arts & Culture talent- of which there are thousands of people out there. Each evening is hosted by a different presenter from various Arts & Culture backgrounds. Mondays- hosted by comedian Auri Styla. Tuesdays- hosted by broadcaster Claira Hermet. Wednesdays – hosted by comedienne Judi Love. Thursdays – hosted by ME! Multi- media broadcaster – JASMINE DOTIWALA! Friday’s – hosted by spoken word poets and public speakers Salma El Wardanay and Lionheart. Isn’t that a great line-up!? Between us we have fingers in so many of London’s arts and culture pies. On The Scene, we’ll be hearing from some of the great unheard voices and talent from all across London, who don’t usually have a mainstream spotlight shone upon them. And…there is so much undiscovered talent in our capital city- but so much of it never gets to shine publicly – but that all stops now- – we’re here to shake things up a bit. IN SHOW 1 I HAD NAUGHTY BOY IN ”CELEBRITY CO-SIGN CORNER”. 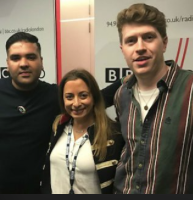 HE CO-SIGNED NEW MUSIC ACT ‘PLESTED’ WHO PERFORMED LIVE IN THE STUDI-SHOWING WHY HE’S BEEN THE SONGWRITING HIT-MAKER BEHIND LITTLE MIX, ZAYN MALIK AND MORE! I’ll have the DOTIWALA SUPER SQUAD in the house and we’re raring to get started and meet some of London’s hidden arts & culture talent. My super squad are digital master Richard Pascoe and culture vulture Rosa Doherty! 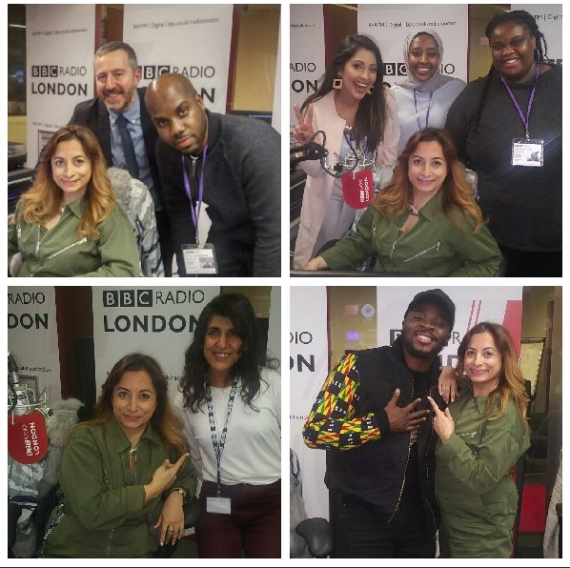 And of course, the core BBC RADIO LONDON TEAM -boss lady Kimbo, Nathan, Havier, David, Pete and more… working their magic behind the scenes! Every week we’ll be bringing you some of London’s undiscovered creatives from all across the entertainment, arts and culture sector, who are doing great different things and we’ll be celebrating them! 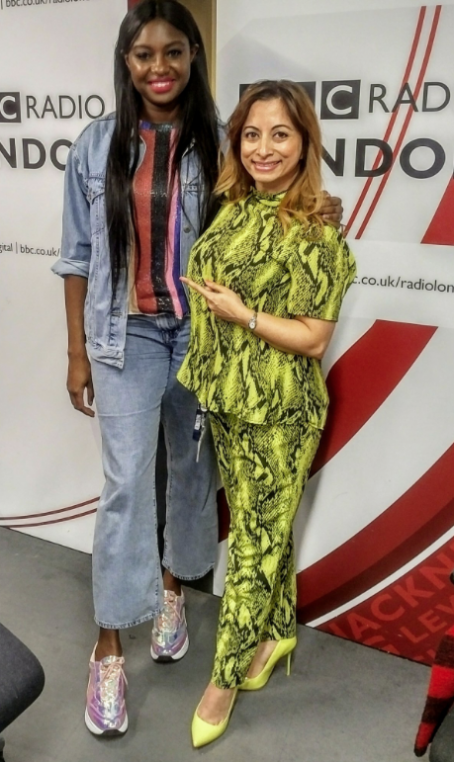 THE INCREDIBLE WEST LONDON BASED SOUL SINGER TERRI WALKER ALSO JOINED ME IN SHOW 1 AND SMASHED A LIVE SET IN THE STUDIO. London’s full of so many different communities who never get to share their various arts and culture offerings – listeners, however many communities you think you know exist in London …. multiply it by a 100 and there are still more…. I mean, we all know that London’s one of the most ethnically diverse cities in the world- in fact a survey in the year 2000 – a survey of school children – reported that over 300 languages were spoken at home! 300! And that was nearly 2 decades ago! Imagine how many more communities are here now-! With this incredible mix of indigenous and ‘other’ in LONDON TOWN, we have one of the most-if not THE most, culturally rich and diverse cities in the world! And THAT’S what we’re celebrating here on RADIO LONDON! IN SHOW 2 I HAD ASIAN FEMALE DJ PSI BINDI WHO PERFORMED LIVE IN THE STUDIO! In an era where arts & culture is threatened by lack of funding, and arts venues are being shut down all over our city –it’s more important than ever to give all of this talent a platform and champion them. SO, Let’s celebrate what does exist! I live in west London, and as I went around my borough this past month, I counted all the various communities that live around me….there are prominent ones we all think we know like the white working class, Caribbean, African, and Asian communities… but within this are– so many other off-shoot communities we don’t usually hear too much about – especially when it comes to arts and culture- like the Japanese, Armenian, Somalian, Bangladeshi, Congolese, Turkish, Korean and more– the list is endless! And it got me thinking of just how culturally rich – yet hidden- some arts in our city are! 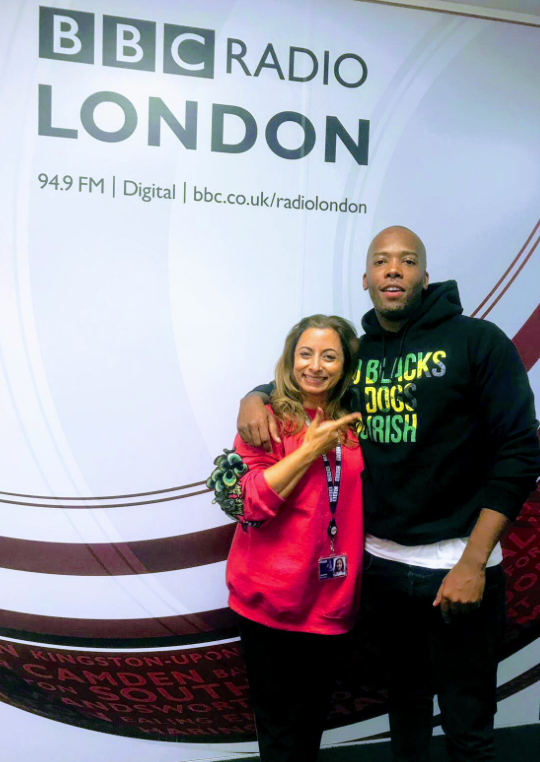 ORIGINAL GRIME NOTABLE MARCI PHONIX SPOKE ON HIS WINDRUSH AND GRENFELL FOCUSED SONGS AND THEN CLOSED SHOW 2 WITH A LIVE SET OF HIS NEW SINGLE ”AN INTRO”. One thing is certain; the definition of art is constantly changing and fluid. When I was growing up art meant visual art, painting, photography, film, music, dance, opera, theatre,….now it means a melting pot of many of the above meshing into each other, and even includes food and culinary art, ….as well as art via the platforms of social media and digital apps. So…. Whether it’s the curator of a new cartoon exhibition in Camden, that illustrates Jewish life in 20th century Britain,or…a Greek comedian promoting his book about life in our capital…we will be bringing you the unique, the different, the unusual and the quirky – right here- on BBC Radio London. What’s different about all the guests on THE SCENE is that they aren’t usually snapped up by the mainstream broadsheets to talk about their work. Hopefully you’ll like what you hear from our guests every week and go out and engage with their art,…get involved and feel a sense of pride about how vibrant our communities are! So you get the idea- London’s full of fun and culture- but only if you know where to find it! On BBC Radio London, every week-night , 8-10pm on THE SCENE! Jasmine’s Juice – I will be Decoding the word ”urban” – with BBC Introducing and Urban Development. 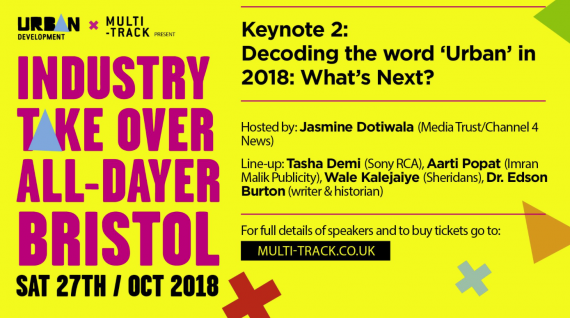 This Saturday I will be hosting a panel in Bristol at the INDUSTRY TAKE OVER ALL DAYER titled ”Decoding the word URBAN – what’s next?”. 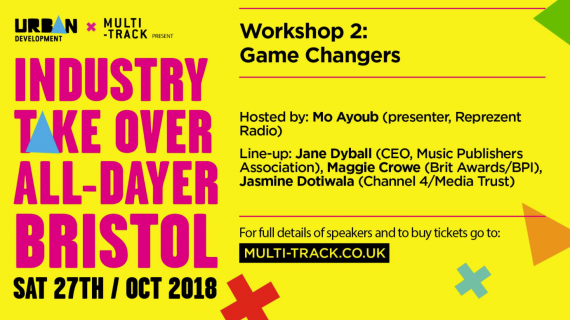 I will also be on the panel for a second workshop titled GAME CHANGERS. 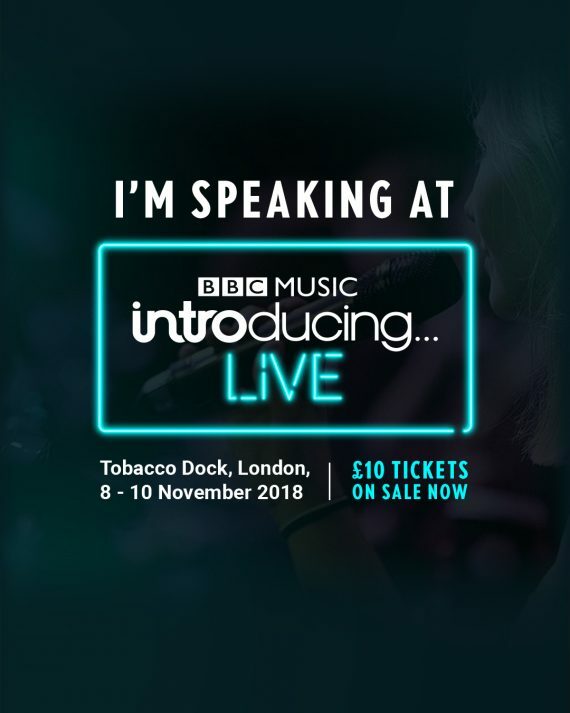 I will also be hosting the same URBAN debate panel in London at the Tobacco Docks on November 10th powered by BBC Introducing and Urban Development. 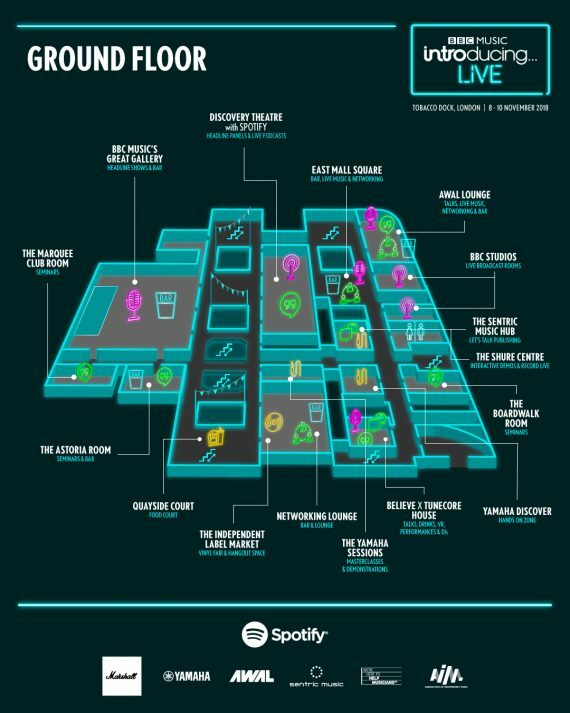 There are so many sessions taking place, it’s the ONE STOP SHOP FOR ALL THINGS MUSIC INDUSTRY! It’s a conversation and debate we’ve been having in the industry for over 2 decades. ”Urban” was a term invented by radio stations and DJ’s like WBLS and Frankie Crocker in New York many years ago- it as supposed to be inclusive. Is it a redundant term in 2018?. How many genres of music would there really be if we separated ‘’urban’’ out into its specific areas? let’s try and count them….hip hop, R&B, reggae, bashment, afrobeats, jungle, grime, garage, drum & bass…. URBAN is a synonym for black popular music. How does the term ‘urban music’ make you feel? Included? Offensive? What are the connotations and prejudices of the word ”urban” in the UK? Eminem, makes black music. David Bowie, made black music. Jon B, makes black music. Phil Collins, made black music. Average White Band, they made black music. Are we afraid of the word “black” music? Why? We have Black History Month, black cinema and Music of BLACK Origin- why are we hesitant to use the word black overall? Urban acts can be black or white. But white Urban acts tend to also be palatable enough to be played on white/pop radio platforms. Is this fair and equal? ”Urban” acts are looked after by diverse staff of all backgrounds and races at junior levels at record labels. Do they always understand the artist, cultural sensitivities and the culture enough to support, educate and communicate with them in the way they might need? Should senior Heads of labels who are black oversee Urban acts? Are there enough senior heads of labels who are diverse? Can ”non-urban” staff oversee Urban acts in context of history/values/etc? Should the word ‘’urban’’ be deleted from the culture? Would the wider global industry be open to deleting the word urban?….and what should we replace it with? Who in the music industry should take a lead and address this if it should be changed? These questions and more will be addressed. Join in the conversation. 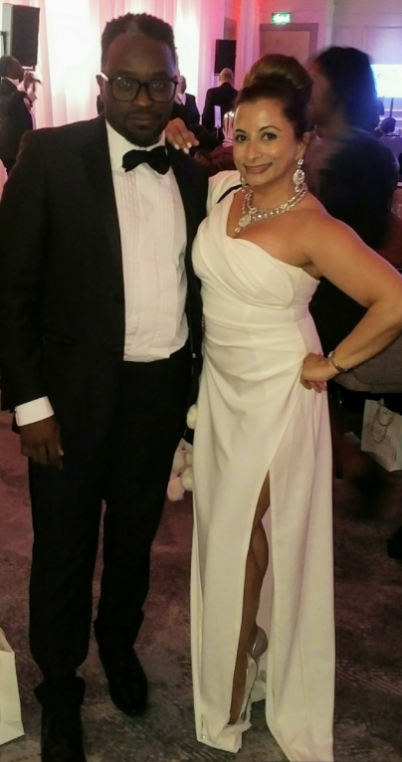 Jasmines Juice- The ACLT Black & White Ball 2018. 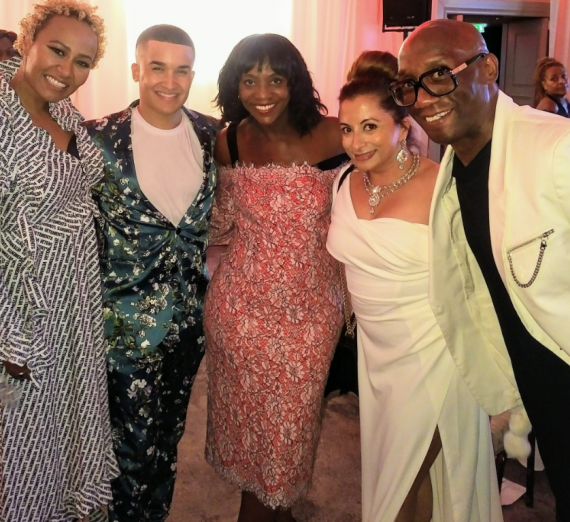 MUSIC STAR EMELI SANDE, JAHMENE, TV BROADCASTER BRENDA EMMANUS, JASMINE AND MICHAEL RICHARDSON (MUSIC ARTISTS MANAGER) AT THE ACLT BALL 2018. 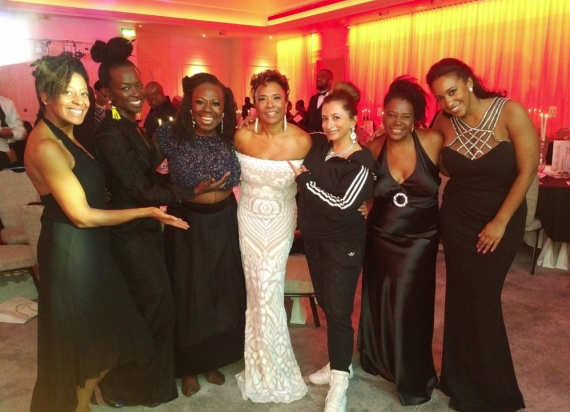 On Saturday night the great and the good of the arts & culture community came together at the Marriott Hotel, Grosvenor Square, after a hiatus of nearly ten years to resurrect the annual ACLT Ball which this year had a back and white theme. 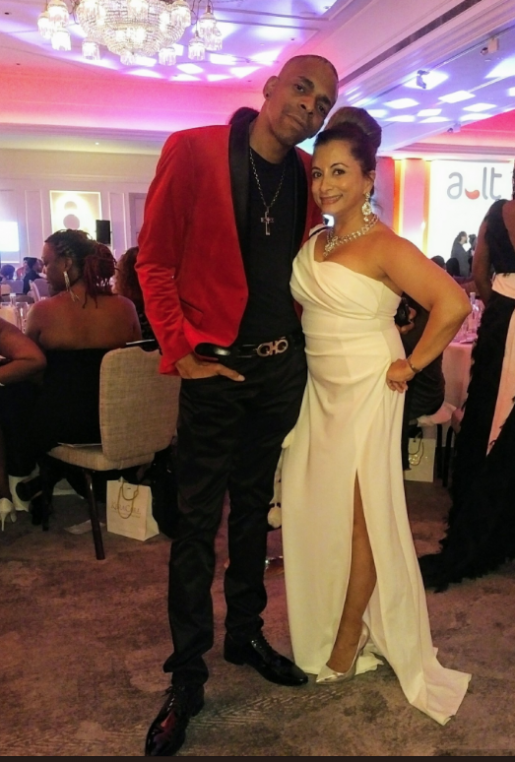 ACLT FOUNDERS BEVERLEY AND ORIN DE-GALE. 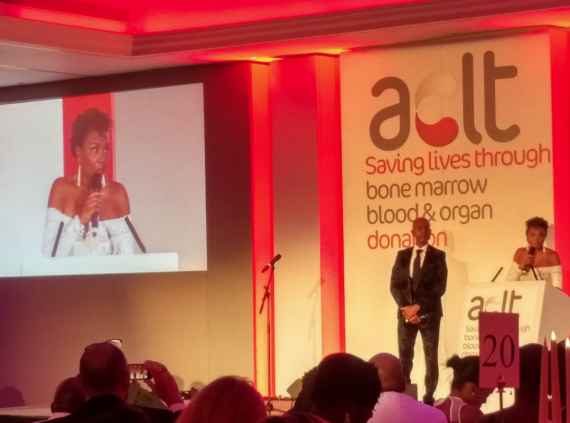 ACLT was founded in 1996 by Beverley De-Gale, OBE, and Orin Lewis, OBE, 3 years after receiving the devastating news that their 6-year-old son Daniel De-Gale needed a stem cell transplant in order to win his 6-year battle against acute leukaemia. 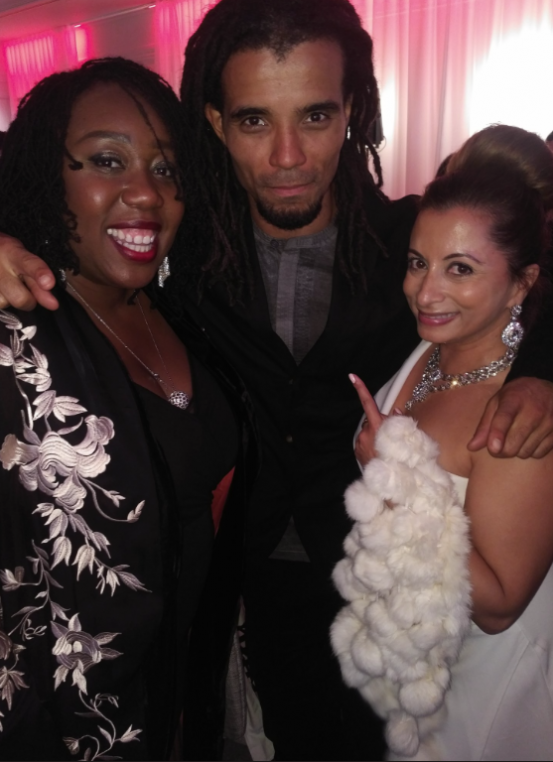 ACTRESS CHIZZY AKUDOLU, MC AKALA AND JASMINE AT THE ACLT BALL 2018. ACLT is a 30+ times award winning charity committed to providing hope to patients living with blood cancer and illnesses where a matched donor (stem cell, blood or organ) is required to save a life. Our work is driven by a belief that no one should die waiting for a donor to become available. Through their work, the ACLT improve odds of finding matches by registering potential donors en masse from all ethnicities, with a focus on donors from the African and Caribbean communities. This is due to an extreme shortage of potential African and Caribbean donors. 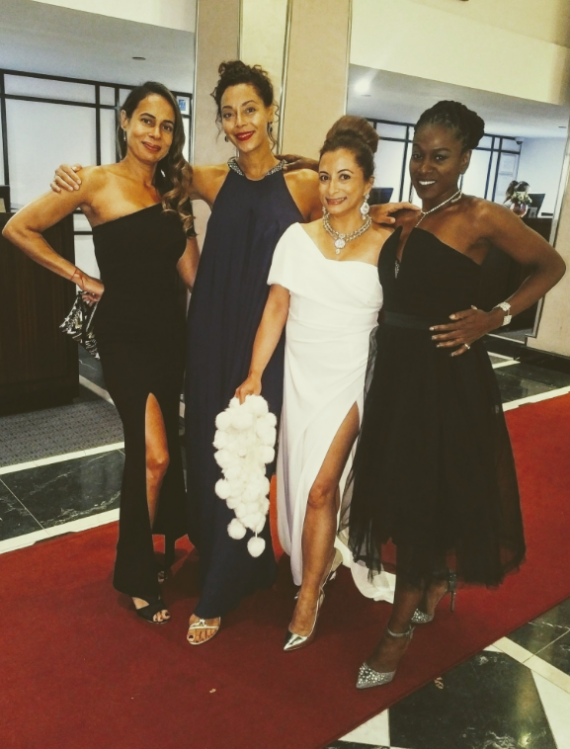 MY GIRL SQUAD ARE ALWAYS EXCITED TO DRESS UP…HERE ARE PR WOMEN JODIE DALMEDA AND JESSICA HUIE MBE, ME, AND THE BBC’S JAY DAVIDSON. Celebrity hosts hosted 30 tables for guests and a sumptuous dinner and entertainment was had by all. JAHMENE’S SINGING BROUGHT THE HOUSE DOWN! 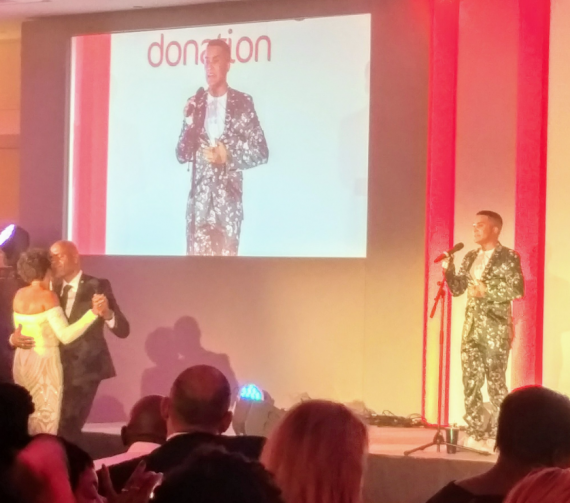 Entertainment included the incredible saxophonist Yolanda Brown as well as singer Jahmene whose rendition of Whitney Houston’s (via Dolly Parton) ‘I will always love you’ went down a storm. Money and awareness was raised all evening for the ACLT cause and guests were reminded to give blood and get on the ACLT blood donor and organ donor register. 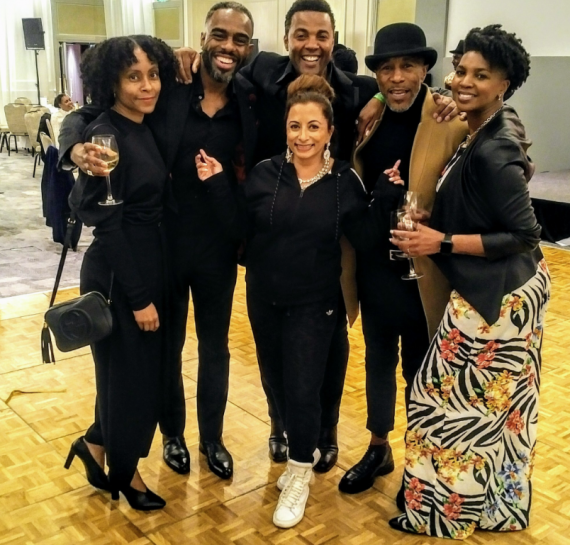 ACTORS CHARLES VENN AND DANNY JOHN-JULES CAME STRAIGHT FROM THE BBC AND STRICTLY COME DANCING WITH THEIR WIVES TO SUPPORT THE ACLT. THEY WERE MOST EXCITED ABOUT SEEING BOXER RAY FEARON! ACLT also provide support and advice to patients and their families throughout medical treatment, from diagnosis to recovery and sadly (in some cases), while supporting the patient and family during ‘end of life’: where treatments have not been successful. MY FELLOW HARLESDEN-ITE – THE INCREDIBLY GIFTED WORDSMITH GEORGE THE POET PASSED THROUGH TOO. The ACLT’s underlying ethos is to educate communities across the UK by raising awareness about stem cell, blood and organ donation. 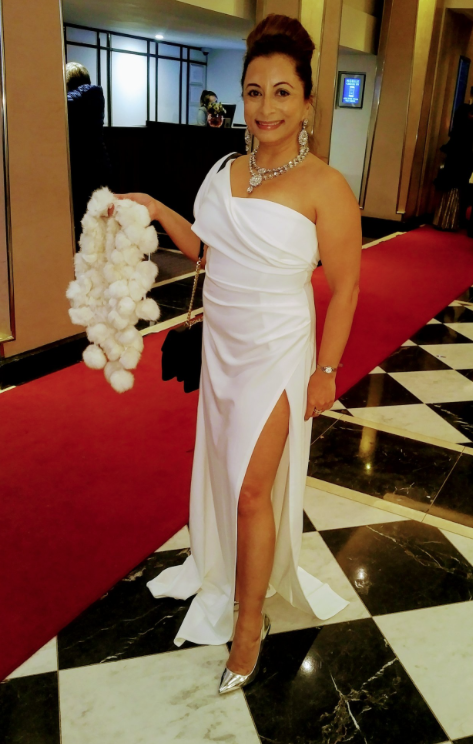 CELEBS OUT IN FORCE FOR THE ACLT BALL 2018! I was honoured to host table 26 which was mostly made up of people that the ACLT is currently supporting and just listening to their experience and journeys so far made me feel honoured to have hosted their table. What heroes! The ACLT’s work raises awareness of the urgent need for stem cell, blood and organ donors within the UK population across all races, but with a key focus on the black, mixed race, Asian, ethnic minority communities. They work closely within these areas due to the severe lack of individuals signed to the registers from these communities. PARTY PEOPLE DANCING FOR THE ACLT! The ACLT believe there should be an unrelated donor waiting for everyone who is in desperate need of a lifesaving transplant – if we all play our part, together we can help put an end to the many lives being needlessly lost as a result of a matched donor not being found at the time someone needs help. 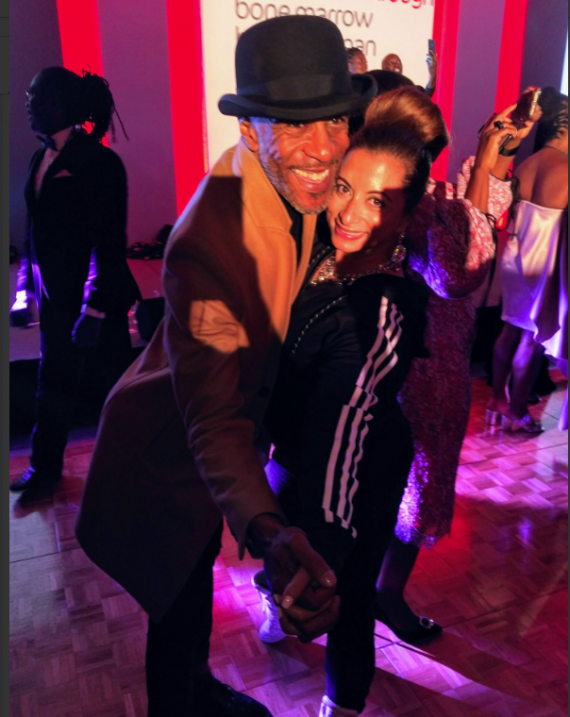 ACTOR AND STRICTLY COME DANCING CONTESTANT DANNY JOHN-JULES KEEEEPS DANCINGGG! MY FAVE UK COMEDIAN – SLIM! I urge you to support the ACLT and spread their message. 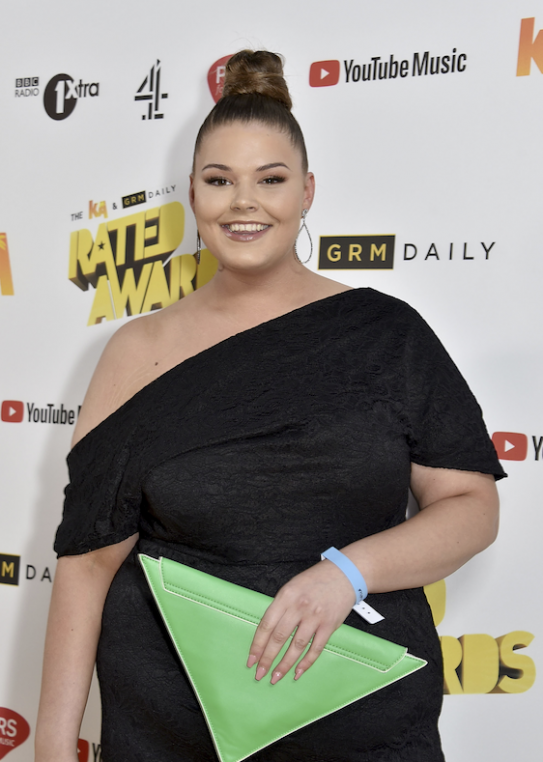 Jasmine’s Juice- THE KA & GRM DAILY RATED AWARDS 2018 – THE UK SCENE CAME OUT TO WIN, CELEBRATE AND PARTY HARD! 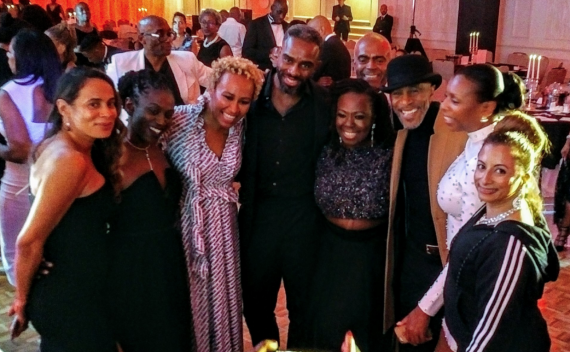 The whole UK black music scene came out to celebrate another year of making great music, building progressive teams and moving the black music industry forwards. 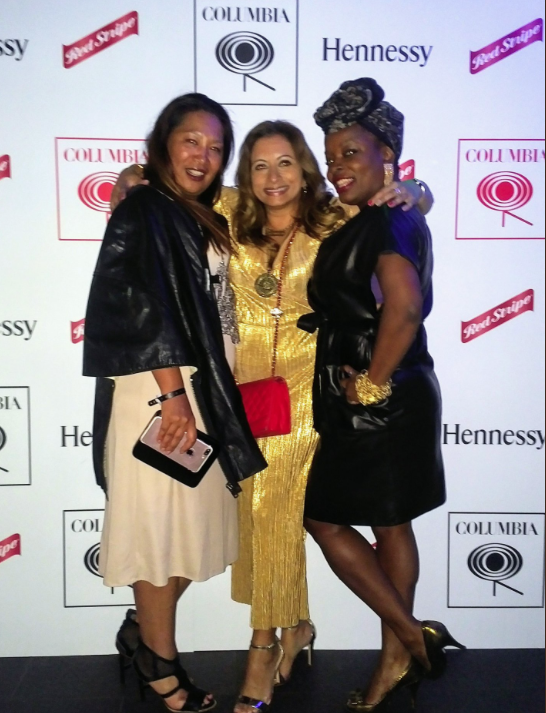 JASMINE WITH SPORTS AND CULTURE BRAND CONSOLUTANT PAOLA LUCKTUNG AND HEAD OF SONY/COLUMBIA MUSIC PRESS TAPONESWA MAVUNGA AT THE COLUMBIA PARTY. 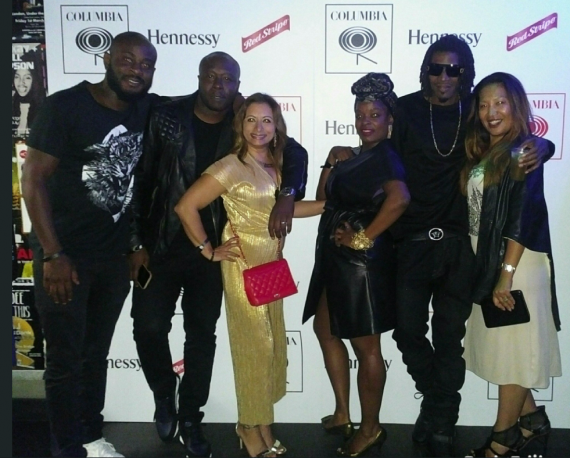 Hammersmith Apollo was a road-block hours before the show started as fans and the industry gathered in their finest regalia to celebrate established names and underground names that the GRM DAILY team have been building and growing for years. 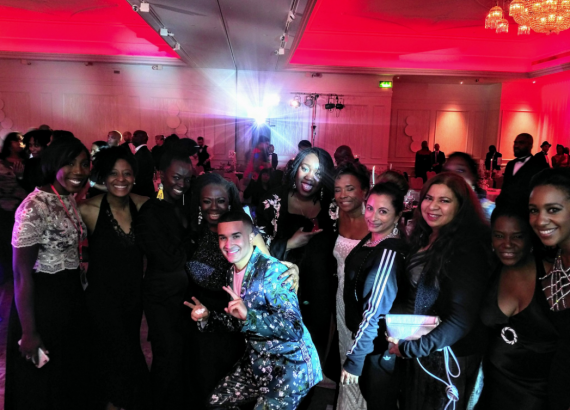 STEEL BANGLES AND MICHAEL DAPAAH AT THE RATED AWARDS 2018. 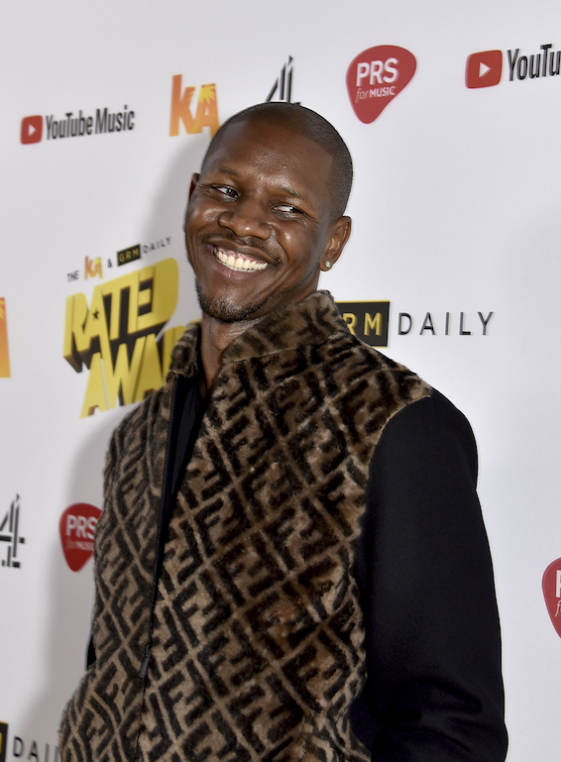 Michael Dapaah, aka Big Shaq, has had an incredible year with the viral sensation Mans Not Hot and, more recently, Man Don’t Dance. Dapaah broke through as the fictional rapper Big Shaq in 2014 with his mockumentary series SWIL. Since then he has gone from strength to strength, with this year being his most prominent in the grime scene. The ante was truly upped with the Channel 4 presence in the house. The sets looked slick and dynamic, the performances had pyro, smoke shooters, rising stages, a screaming fan-pit flanking the stage and an audience full of celebrities like Naughty Boy being heckling with banter from our hosts MO the Comedian who is hilarious and the sharp and fabulous Julie Adenuga. Big winners on the night also included D Double E, Not3s and Kenzo, who were just a selection of the exceptional names from the urban music scene honoured in front of thousands of artists and industry players. 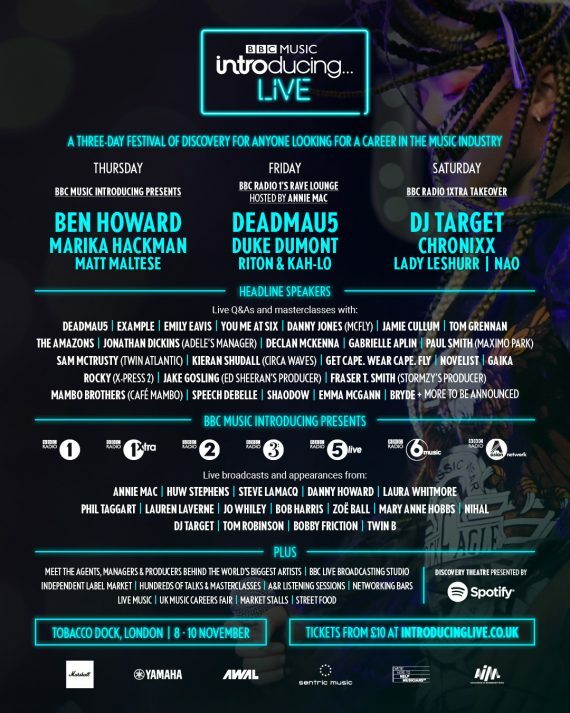 Presenters included: Tim Westwood, Charlie Sloth, Michael Dapaah, Josh Denzel and more. GIGGS HAS A LOT TO SMILE ABOUT AFTER AN INCREDIBLE YEAR MAKING AND TOURING HIS MUSIC. 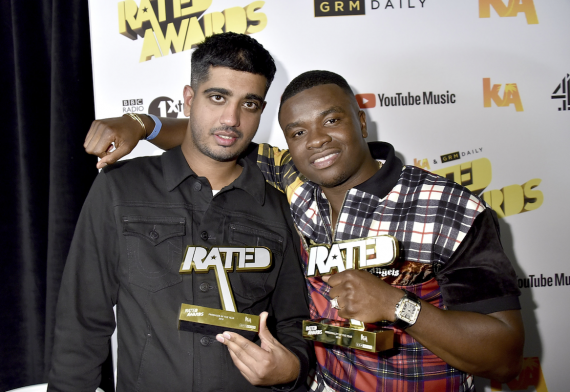 The KA & GRM Daily Rated Awards pride themselves on giving power back to the people, honouring the true heroes of the genre, with all but one category (The GRM Legacy Award, supported by BBC Radio 1 Xtra) voted for by fans. And, in a KA & GRM Daily Rated Awards first, tickets were available for fans to attend the event. D DOUBLE E AT THE RATED AWARDS 2018. 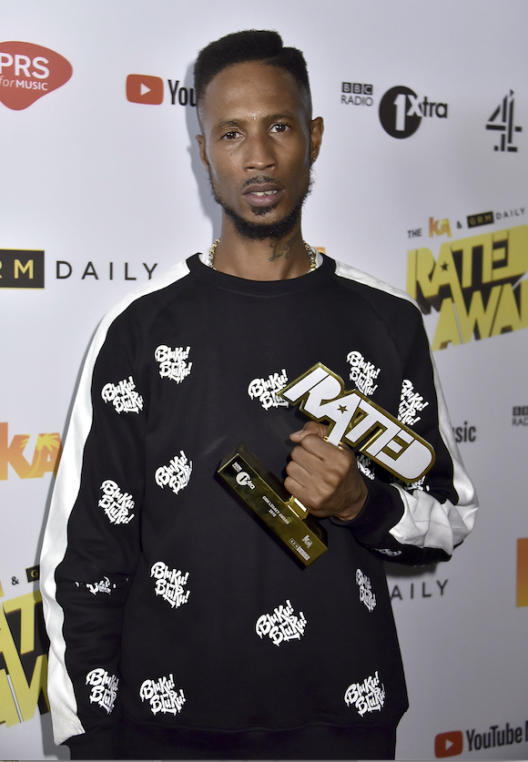 D Double E took The GRM Legacy Award (supported by BBC Radio1 Xtra). The iconic rapper from Forest Gate, East London has been a huge player in the music industry, with a career spanning over 15 years. He has inspired grime heavyweights Skepta and Dizzee Rascal, as well as countless other MCs who have followed his career from his days with N.A.S.T.Y Crew, to his most recent album Jackuum. THE LOVELY MAYA JAMA AT THE RATED AWARDS 2018. Other winners included Fredo who was awarded Mixtape of the Year, whilst Charlie Sloth took home Radio DJ of the Year. Best Video of the Year (sponsored by YouTube Music) went to Rapman and Kenzo was honoured with the KA Get Rated Award. AJ Tracey ft Not3s was presented with the Track of the Year Award (sponsored by PRS for Music) and Nines took home the Best Album of the Year Award for Crop Circle. 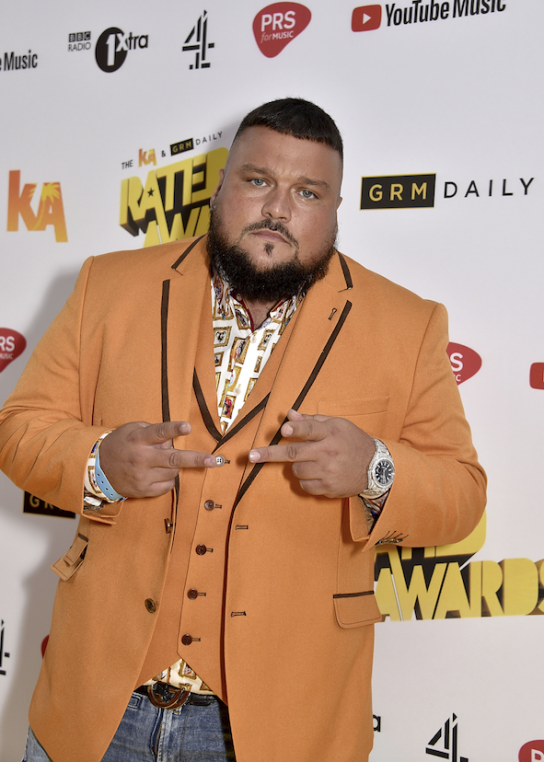 BBC RADIO DJ CHARLIE SLOTH TOOK THE BEST DJ AWARD 4TH YEAR IN A ROW. 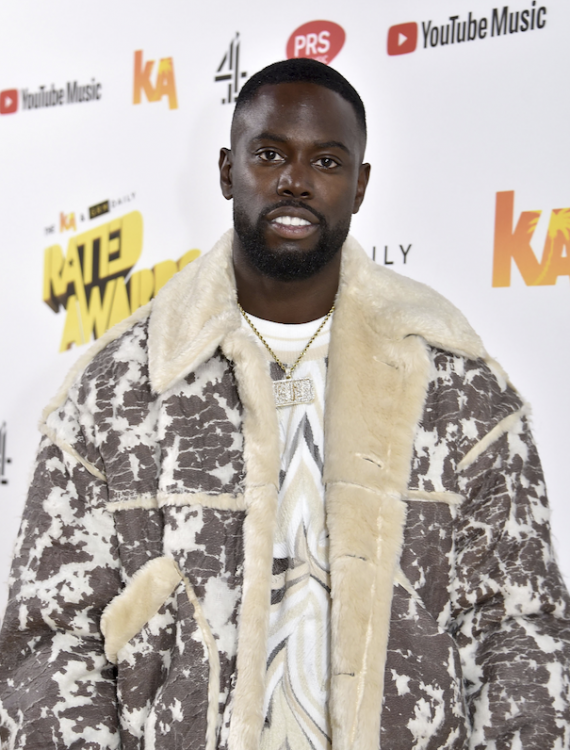 GHETTS GOT MAD LOVE FROM GUESTS AFTER HIS SONG BLACK ROSE HAS REALLY CAPTURED HEARTS. Afterwards most of the stars ended up at the COLUMBIA MUSIC UK party at Under The Bridge in Fulham, where the Hennessy and ginger cocktails were in abundance, the chicken wings and fries energised us for a dance-off until i had to make my polite exit around 1.30am. Outside hundreds of guests were trying to get in to the road block party night. It was BIG. ONE OF THE MAIN MEN BEHIND THE BRAND GRM DAILY AND THE RATED AWARDS IS POSTY- A MAN WITH VISION, TRUST AND LOVE IN THE BRITISH BLACK MUSIC SCENE. NAUGHTY BOY TOOK HIS HECKLING FROM MO THE COMEDIAN IN GOOD SPIRITS. 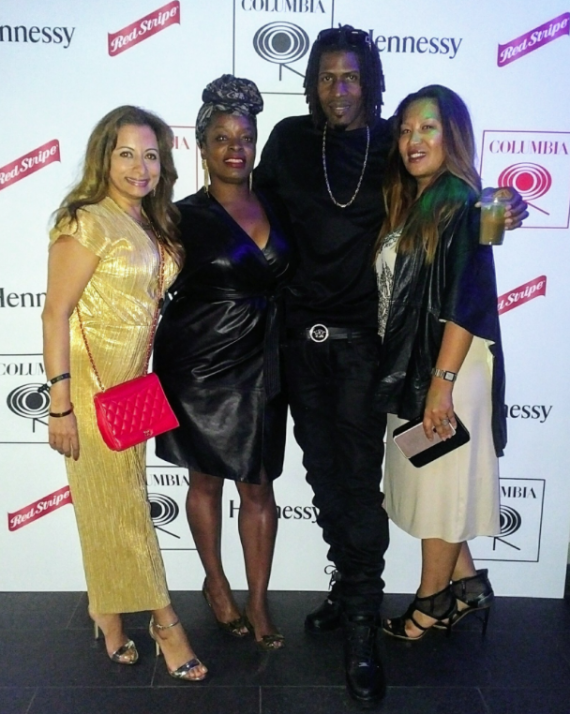 THE GIRLS WITH UK MC LEGEND BUSHKIN AT THE COLUMBIA PARTY.